How will Monsanto monetize this? Young laid out four main ways that Monsanto will monetize the open platform. Subscriptions through FieldView, which will increase in price as integrated technologies, like Veris, add more value. Revenue share agreements with data providers. Potential movement into new verticals, such as animal agriculture, through a platform licensing agreement. Selling information, particularly weather data, into other industries, through API call agreements. Monsanto could also use the data it’s capturing and insights it’s giving farmers to boost its traditional seed and chemical products business. By providing agronomic tools, Climate Corp, and other data-driven digital ag providers, are standing to disrupt farmers’ traditional relationships with their retail agronomists; agronomists that are often the the point of sale for ag products, according Matt Bell, principal at agtech venture capital firm Cultivian Sandbox and a former agronomist. “I think, and it’s just my opinion, that companies like Monsanto and DuPont could be thinking about how disruptive online sales could eventually become and how companies could use it to communicate more directly with growers and to capture more margin from within the overall supply chain,” he told AgFunderNews. Why is Monsanto doing this now? Monsanto’s commitment to building a digital ag product has cost it over $1 billion in investment, not least its $930 million acquisition of Climate Corp in 2013, and they’ve made it clear that they see new value coming from being a data company. So this week’s announcement is in line with those plans and Monsanto’s traditional approach to market dominance, argued Tim Koide, cofounder of HarvestPort and formerly at Mitsubishi Corporation. “They will take what they think they need to build a complete solution and own it,” he said. 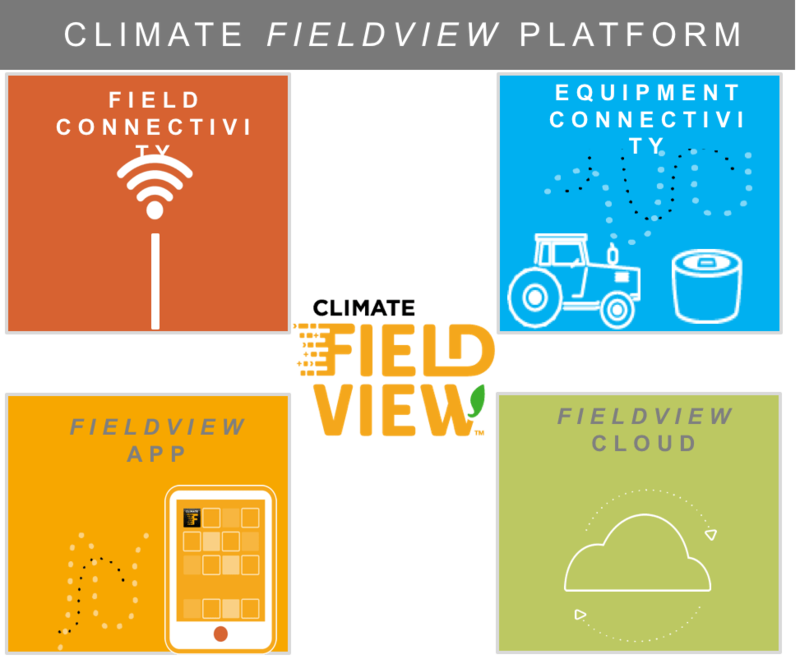 Monsanto also announced this week that Climate FieldView services have reached 92 million acres, of which 14 million are paid for. It is now targeting 25 million paid acres in 2017 and by 2025 wants to have reached 300-400 million paid acres, according to a press release. Building up the platform through partnerships is not a new concept and partnerships between agtech startups have been slowly picking up pace in recent months as companies realize they cannot penetrate the ag market alone. Agtech adoption has been a huge challenge for the majority of agtech startups. Distribution channels are still largely relationship based, and many technologies require a behavior change from farmers, as well as a good deal of time and understanding to implement them correctly. Partnerships also clearly add benefits to the quality of the information agtech companies provide farmers. What does all of this mean for the industry? Creating a centralized dashboard for farmers to integrate all of their incoming data is what farmers have been calling out for. Of course, Climate Corp isn’t the only one trying to offer this. There are several farm management software platforms that are working with farmers to integrate their various data streams into one place, with varying degrees of success. A recent report said this part of the market would be worth over $4 billion in six years’ time. Some of these own their own sensor companies, which they deploy on the farm as part of the service, and others are starting by offering ERP systems for farmers with the eventual aim of opening up for integration with third party data companies, like Climate Corp is doing. While still at the early stages, data standardization initiatives like AgGateway’s SPADE project in the US and AgroIT in Europe stand to help these startups integrate with other data providers, to create competing platforms with Climate Corp. Climate Corp is planning to explore integration with other software providers, and has already been contacted by businesses with ERP systems they want to integrate, according to Young. These partnerships, and those with sensor companies, will likely be a precursor to best-in-class technologies emerging, and consolidation among the rest that fail to gain meaningful market share. Where Climate Corp really differs from the other options on the market is in its other revenue streams. It makes complete sense for Monsanto to use the intelligence it will gather from its network to better serve its customers on the products side. But farmers might balk this connection and be resistant to disrupting their existing relationships by using the platform. Partners and farmers might also question how else their data will be used by Monsanto. And this might present Monsanto and Climate Corp’s biggest challenge in this new endeavor.